We were fortunate to be in Hobart during the Taste of Tassie food festival, just a short walk from where we’re staying. Because it was the middle of the day, we steered clear of the many vineyard and spirit vendors, and focused on tasting some of the great variety of food on offer. First up was Palawa Kipli who have interpreted traditional aboriginal food to make it more accessible. We chose two small bites: pulled wallaby with beetroot, wattleseed and walnut dip; and saltbush Peppered guacamole topped with crickets. The wallaby was quite similar to pulled beef, and paired well with the beetroot. While the crickets looked intimidating, they were not strongly flavored, making a nice guacamole bite. 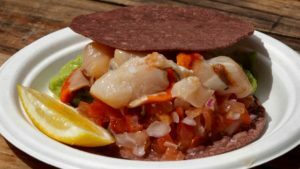 We moved through the main hall to an outside area where we found Vineyard Seafood Scallop Bar who were offering a ceviche Scallop. Given our enjoyment of fresh Tasmanian scallops, this was a no brainer to try. The inclusion of the roe (coral) and ceviche preparation enhanced the Scallop flavor, which Foodie Philip really enjoyed, while Foodie Greg, who is not that keen on “fishy” flavors found it a little too much flavor! We returned to the main hall and found the Mt Gnomon Farm stall. 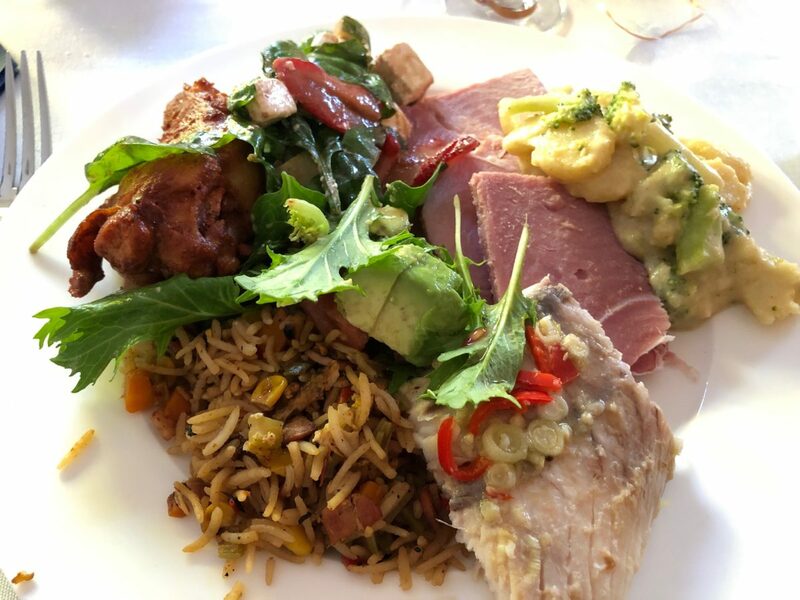 At the last family reunion In 2015 Foodie Philip had tried to book at the farm’s restaurant, but they had a private function on the only day he and his mother had available, so we were looking forward to this. We chose their Lao Laarb. 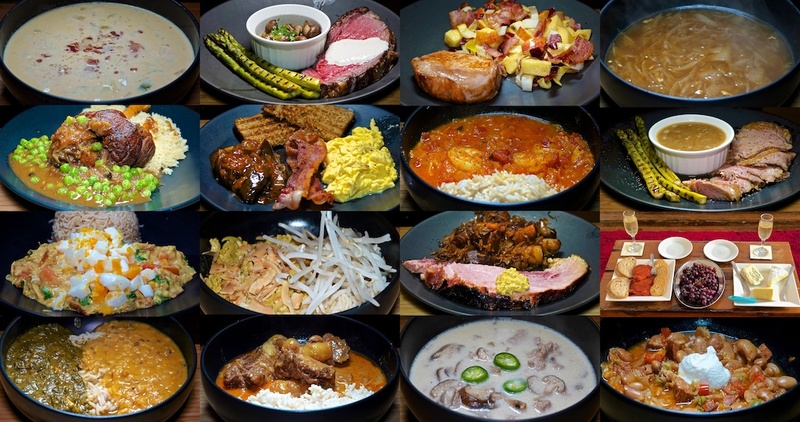 The Laarb has all the flavors we were expecting, and were really well executed. The young lady serving us suggested we try their sausages, which we will likely do tomorrow. The farm raises heritage pork, which has so much more flavor than modern pork. Our final stop today was for a duck roll, as Foodie Greg was craving some, after missing the Peking Duck yesterday. Because it was from The Porky Duck, we added a side of pork crackling! Both the duck roll and crackling were excellent, and we could have easily gone back for more. All up we spent Au$25.00 (US$17.50) per person. 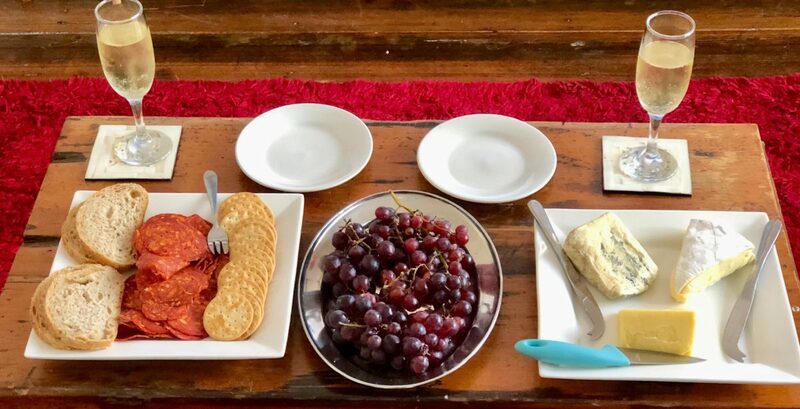 Tonight was New Years Eve (on the wrong day in this blog because we didn’t skip a day after crossing the date line) and we did our traditional cheese, salami, grapes and champagne spread. We had great views of both sets of fireworks, a good feed and some good bubbly! In total we spent Au$37.43 (US$26.20) per serve and were full at midnight, with chorizo left over! We spent the second half of December in Australia where the time was split between our home town of Newcastle where we still have family, and Tasmania where Foodie Philip was born, but has not explored as a tourist as his family left Tasmania before he was 10. Dinner eaten out: $22.39 ($22.13). Our lunches at home average in a fairly narrow band and this month is only a few cents per serve up from last month. Lunches prepared outside the home are also lower. 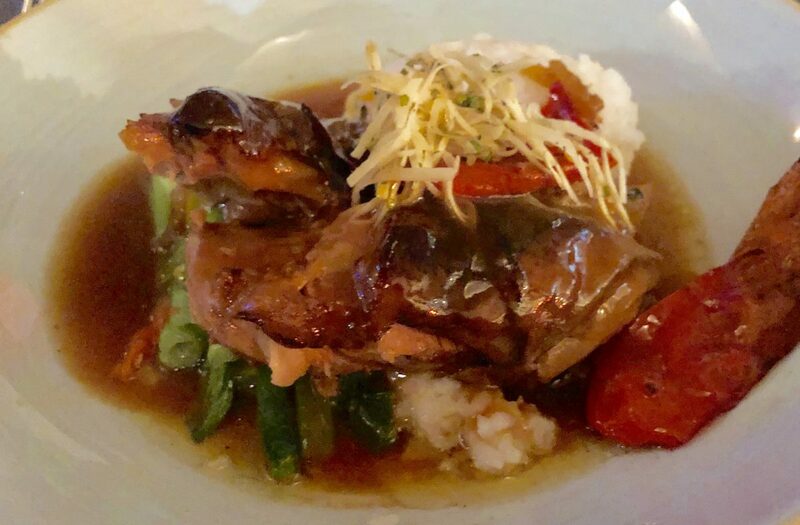 Our most expensive meal for the month was at the Mud Bar and Restaurant in Launceston where we had some excellent sushi as a starter and an Asian flavored braised lamb for $42.00 per person. Our most expensive at home meal was Prime Rib with Garlic Butter Mushrooms and Asparagus for Foodie Philip’s birthday at at $11.46 per serve. This month’s meals at home are slightly lower than our long term averages. Lunches at home cost 34% of the cost of eating food prepared outside the home, while dinners at home cost 23% the average of dinner out this month. Had we purchased every lunch and prepared none it would have cost us $252.03 per person in December. We actually spent $49.91 for lunches at home plus $73.16 for lunches purchased or eaten out: $123.07 in total. Had we purchased every evening meal out and prepared none at home, it would have cost us $694.09 per person. We actually spent $107.77 for dinners at home and $89.56 for dinners out: $197.33 in total. We saved $625.72 by preparing and eating most meals at home, even when traveling, plus we have better control over what we eat. Over the month we prepared 17 different recipes for evening meals. 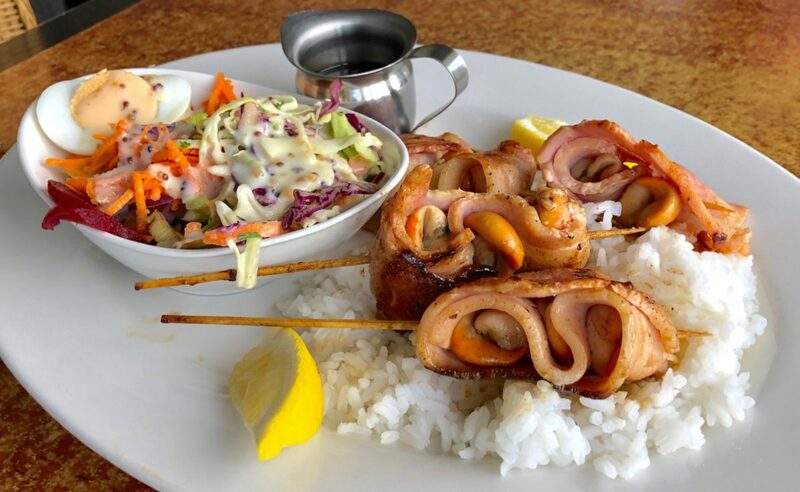 The Foodies had planned on lunch at Masaaki’s Geeveston, but they won’t be back until Jan 11! Fortunately there was a bakery up the street and we had a Curried Lamb pie, a Pepper Steak Pie, and two small sausage rolls, which were pretty good for Au$9.30 (US$6.51) per serve. Near where we were shopping for tomorrow night’s celebration we found a Chinese BBQ place, that had duck in the window yesterday. 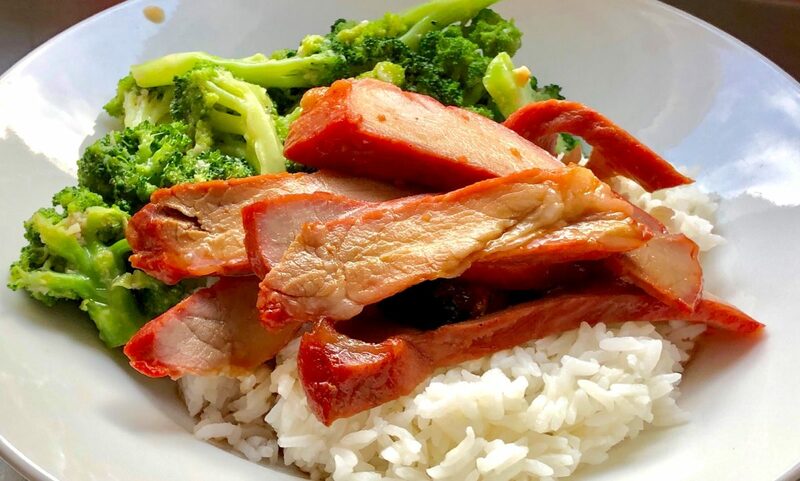 Today no duck, but the BBQ Pork looked good, so we ordered that with garlic broccoli and rice. Of course, as we came back to pick up our food, the duck came out of the kitchen! The BBQ Pork was really good, and we agreed that, if broccoli was normally this good, we would eat more of it. Satisfying and tasty, with leftovers for Au$28.50 (US$19.95) per serve. Traveling down the East Coast of Tasmania we were in Bicheno for lunch. Again, a short search on Yelp for pies, found a really good (and busy) bakery. Foodie Philip had a Scallop Pie – a first – while Foodie Greg indulged a passion for a Cornish Pasty. We both also had Sausage Rolls with tomato sauce, which is a lot less sweet than ketchup. The Scalllop pie was a first for Foodie Philip. In a light curry sauce that did not overpower the generous serve of scallops, it was really tasty. Foodie Greg enjoyed his pasty, but the sausage rolls were just okay. A satisfying meal for Au$14.5t (US$10.19) per serve. That Scallop pie was not cheap! To complete the Aussie food theme, we found Burgers got Soul in Hobart and had a kicked up version of a traditional Australian style hamburge, with salad, beetroot, bacon and egg. We took them back to our rental accommodation and enjoyed them in a grden setting there. Really good burgers for Au$14.95 (US$10.46) per serve. Exploring the Tamar Valley area of Tasmania we turned to Yelp again and found excellent Fish and Chips in George Town, at the local fish processor. We opted for the “gold” fish choice, which was flathead. The fish was perfectly battered and cooked, the fries well done and it was served with a simple side salad. We also chose some fried Tasmanian scallops, because they are fresh, and always served with the coral (roe) that is absent in the US, because it is perishable and has to be served fresh. All up it was Au$16.90 (US$11.83) per serve, and well worth it. Our evening meal found us in Scamander on Tasmania’s East Coast, where Foodie Philip spent many holidays as a child. We ate at the Scamander Resort, which was really an up market pub. We both chose the Scallop & Bacon Kebabs (got to eat those scallops while we can). The bacon and scallops were really well cooked, and not over done. Interestingly the side salad was dressed with salad cream (sweetened condensed milk with vinegar), which was a staple in the Hodgetts family until Mother passed. Foodie Philip started life in Tasmania, so that’s probably not a co-incidence. We both enjoyed the fairly generous serve for Au$24.50 (US$17.15) per serve. You can see the orange coral on the side of the scallops. Today we traveled to Launceston via Sydney. Our friends met us at the train station and we went to their home for a lovely lunch of home made spaghetti marinara. After checking in to our hotel in Launceston we immediately went to work finding a place to eat that would be open when we got there. We found the Mud Bar & Restaurant and are glad we did. We chose the two course option and had some excellent Sashimi, including seared beef, for the appetizer, which was accompanied by a ver good broth. Given our recent flirtation with slow cooked lamb, the offer of Asian flavored braised lamb was irresistible. It was exceptionally tender and the Soy, ginger flavors worked surprisingly well. This was an excellent dish, and a most enjoyable meal for Au$60.00 (US$42.00) per serve. Our low light photo doesn’t do it justice. We still had some some Blue Castillo, cheddar, chorizo, crackers and cherries so again we snacked. A pretty good range of food for Au$5.94 or US$4.16. We had the chicken legs from our supermarket chicken, and a fair amount of the Spinach, Strawberry and Feta Salad, so that was dinner. The salad was Au$1.92 per serve. While not the most exciting meal it was satisfying for Au$4.42 (US$3.09) per serve. I do know the calendar, but for simplicity’s sake I did not compensate when we skipped a day traveling to Australia, so we are celebrating a day ahead of the USA. We purchased some Blue Castillo, some cheddar, chorizo, crackers and cherries and snacked. We only finished half of everything, so we’ll do it again tomorrow. With a shared meal we contributed a spinach, strawberry and feta salad. Danish feta, which was very smooth, was aU$7.20 or 72c per serve. We actually had a lot left over but it was good for Au$1.92 (US$1.35) per serve. Today we had lunch with Foodie Greg’s parents who took us to a yacht club with a restaurant out in the lake. Foodie Greg had Salt & Pepper Squid, while Foodie Philip had the above mentioned Rump Steak, etc. We both enjoyed our meals. The rump had well rendered fat, which is difficult when served rare. Overall, an enjoyable meal. Tonight we joined the rest of the family to celebrate one of our niece’s birthday at a Korean restaurant. Foodie Greg had pressure cooked short ribs, which was appropriately tender and flavor some. Foodie Philip opted for BBQ eel, which was also very good. Served with kimchi and other pickled sides, it was a good representation of Korean food. Warners Bay (NSW) has a great Indian take out, so today we got garlic Naan, Lamb Korma and Butter Chicken Sauce over very good rice. The Naan is prepared to order in the in-store tandoor so it’s exceptionally fresh. Like I said, great Indian for Au$11.25 (US$8.12) per serve. 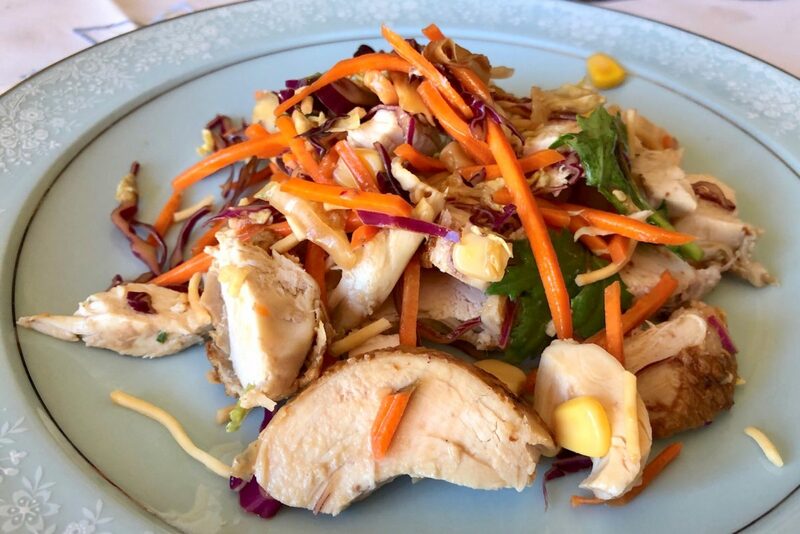 For dinner we sliced the remaining chicken bread and mixed it with the remaining Asian salad. The Asian salad kit was Au$3.99 or $1.00 per serve. The meal was filling and tasty enough to satisfy for Au$3.50 (US$2.47) per serve.